A new, extremely bright and, once again, mysterious and still unexplainable "White Material" that, maybe, we, as IPF - but we are not one-hundred-percent sure of this circumstance - had already shown you, from a VERY different perspective, in the APODs of June 19 and 20, 2015), is now visible from atop. What is, then, the White Stuff/Material that lays both in and (here and there) around this Unnamed Impact Crater located on the Surface of the so-called "Dwarf Planet" 1-Ceres? Nobody knows for sure yet. The Planetary Scientists' Community is still puzzled by the nature of these Spots, and, as we have already written in the past, many of them are now considering (as acceptable) several explanations, which include (like we, as IPF, had - humbly, of course - already anticipated in the recent past) the presence, on the Surface - and Sub-Surface - of 1-Ceres, of Salt and - most likely - (Water) Ice. 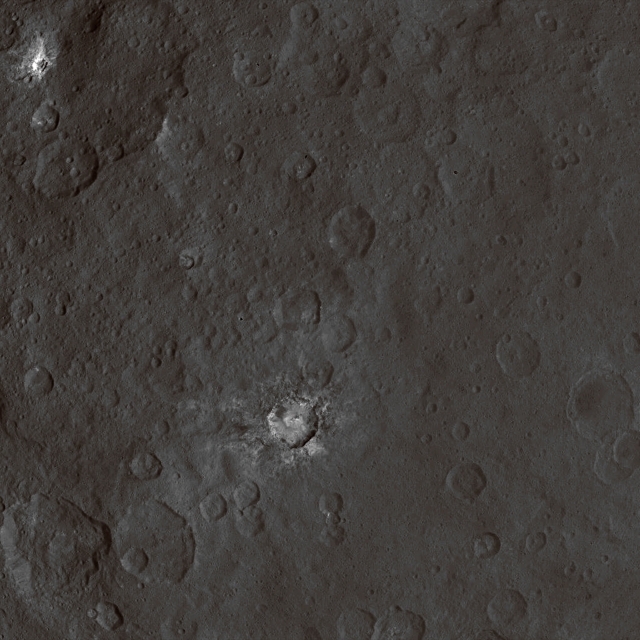 This (these) unusually-looking Surface Feature(s) - as a matterof fact, another "White Splash", extremely bright and clear, that can be seen in the upper left (Sx) corner of the frame - is (are) very well visible in this beautiful Contextual Image, taken by the NASA - Dawn Spacecraft on June 9, 2015. Just out of curiosity, this specific frame is just one among the first snapshots coming from Dawn's second Mapping Orbit of 1-Ceres, which is carried out from an altitude of approx. 2700 miles (such as about 4345,218 Km). The Resolution here is roughly 1400 feet (such as approx. 426,72 meters) per pixel. The image (which is an Original NASA - Dawn Spacecraft's b/w and NON Map-Projected frame published on the NASA - Planetary Photojournal with the ID n. PIA 19582) has been additionally processed, magnified to aid the visibility of the details, contrast enhanced and sharpened, Gamma corrected and then colorized (according to an educated guess carried out by Dr Paolo C. Fienga-LXTT-IPF) in Absolute Natural Colors (such as the colors that a normal human eye would actually perceive if someone were onboard the NASA - Dawn Spacecraft and then looked ahead, towards the Surface of 1-Ceres), by using an original technique created - and, in time, dramatically improved - by the Lunar Explorer Italia Team.